Serving the L.A. Pagan community since 1999! For a list of all upcoming rituals, scroll down or go HERE . Want an email reminder of our rituals? Fill out this short form. Raven's Cry Grove, ADF presents our modern Druid Beltaine ritual celebrating the Queen and King of May. Noisy are the birds, green the woods. The world around us is becoming more vibrant as it enters Summer. We too are becoming more vibrant. And as the fires of the sun grow stronger in the sky, so too do our own fires grow stronger. Let’s join together in celebrating the joys of Beltaine, the Hinge of Summer, the Day of Blessings? Now the Earth grows green again; in fact, warmed by the power of the Sun and the waters cool strength. Shoot has become bud and bud is flowering as all life burns with the kindling of love’s fire. Now we rejoice in the heat of Spring, and look forward to the greater heat of Summer. 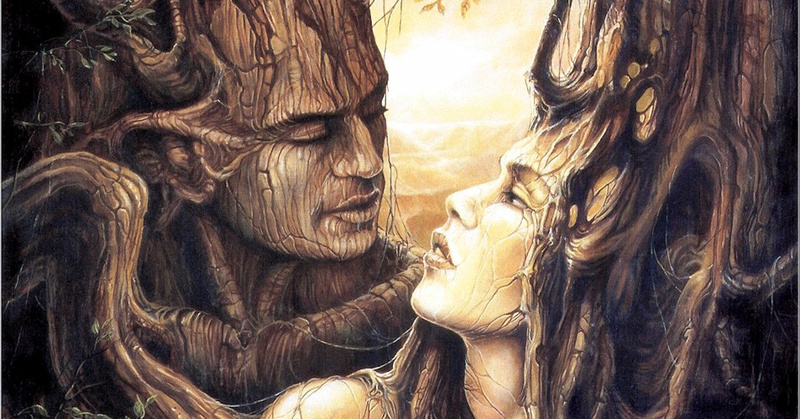 So, on this day, and especially this day, come join Raven’s Cry Grove in a Celtic celebration of Beltaine, featuring the wedding of the May Queen and the Green Man. Our Grove presents public ritual for each of the eight modern Pagan high days. Our rituals are carefully constructed to lead everyone into a greater understanding of ourselves and the world we live in. No experience with Druidry or Paganism is needed, just an open mind to some new ideas. WHEN: Saturday April 27, 2019. Ritual begins at 4pm sharp. Please allow for Saturday afternoon freeway traffic so you arrive on time. After ritual we will enjoy potluck. To help us present excellent public rituals, we suggest a donation of $10, but no-one will be turned away for lack of funds. Please feel free to bring personal offerings for the ancestors, nature spirits, and deities. It does not need to be biodegradable, but should be non-toxic if buried or put into water. Parking is $5 per vehicle, paid to an "iron ranger." Do not trust your GPS to take you to the exact location. Here are detailed directions that are correct. The directions look a bit complicated, but the drive is actually straightforward. There are photos at our Facebook page which are a sort of tour up to the ritual area. FROM THE SOUTH: From Woodland Hills, exit the 101 Freeway at Valley Circle (exit 29) . Turn North on Valley Circle approx. six miles to the three-way stop at Woolsey Canyon Road, and turn left. Proceed up Woolsey Canyon to its terminus at Black Canyon Road or North American Cut Off Road depending on the map you are using, and turn right. The entrance to Sage Ranch Park is approximately 200 yards north of the intersection. Do NOT continue on Black Canyon Road down into Simi Valley. FROM THE NORTH: From Chatsworth and the 118 Freeway, take Topanga Canyon Boulevard. south to Plummer, and turn right. Follow Plummer to the intersection with Box Canyon Road, veering left (south) onto Valley Circle. At the intersection with Woolsey Canyon Road, turn right. Proceed up Woolsey Canyon to its terminus at Black Canyon Road or North American Cut Off Road depending on the map you are using, and turn right. The entrance to Sage Ranch Park is approximately 200 yards north of the intersection. Do NOT continue on Black Canyon Road down into Simi Valley. IN THE PARK: Once in the park, take your first left and drive through the gate and down the hill, past the parking lot. Turn right at the bottom of the hill and we’ll be under a big oak tree on the campground loop road. Ár nDraíocht Féin: ADF is an international fellowship devoted to creating a public tradition of Neopagan Druidry. Though we do not consider ourselves Re-constructionists -- we do believe in the importance of scholarship. Through the on-going study and discussion of archeology, history, and comparative mythology we have developed methods of worship that we believe our Paleopagan ancestors would recognize and respect as akin to their own. The Shining Ones, the Ancestors, and the Nature Spirits deserve the very best that we can give them, so we encourage our members to pair their study and critical thinking skills with the pursuit of creative and artistic excellence. NEOPAGAN DRUIDRY: Rooted in ancient soil, yet reaching for the stars -- Neopagan Druidry is a tradition, a philosophy, and a way of life for its practitioners. Neopaganism is a vital and creative movement that draws upon the best aspects of the Pagan faiths of our ancestors to create a holistic, pluralistic path which allows for art and science, reason and emotion, and peace and ecstasy to be experienced harmoniously. Druidry is a branch of Neopaganism which draws its inspiration from the priests, priestesses, wise ones and magicians of the ancient Celts. Druidry calls for excellence in all pursuits, be they physical, mental, artistic, or spiritual. Although Druidry implies a Celtic inclination, together as a grove we work with all Indo-European cultures -- with due respect for their commonalities and differences. We encourage our members to follow their hearts when choosing a tradition or traditions upon which to focus their scholarship and personal devotion. GROVE MEMBERSHIP: Membership in Raven’s Cry Grove is open to anyone who has attended at least one public ritual and supports the aims of Raven’s Cry Grove and of ADF. Becoming a Member implies a willingness to study, to be of service during public rituals and other activities, and to provide financial support as one is able. Joining as a Friend is a way to learn about Raven’s Cry Grove and ADF, while deciding if druidry is the path for you or if you simply wish to support the Grove and its work. Joining as a Member is a two-way commitment with our Grove to be active and support the fulfillment of our group Vision, and to be supported in turn by our diverse family of seekers as your personal spiritual journey unfolds! If you are interested in becoming part of the Raven’s Cry Grove family, please talk with one of our leaders or send us an email through our website. LEGAL: Raven's Cry Grove, ADF is a religious organization incorporated in the State of California. We are a Grove within Ár nDraíocht Féin: A Druid Fellowship a 501(c)(3) nonprofit church incorporated in the State of Delaware. Contributions to Raven's Cry Grove are tax-deductible to the full extent allowed by law. Raven’s Cry Grove, ADF, (RCG) was founded and officially approved as an ADF Protogrove on July 22, 1999, as submitted by the Grove Organizer, Todd Covert, (aka Ravenbard). The grove happily sponsored their first event, a workshop given by ADF Vice-Archdruid, Skip Ellison, on October 7, 1999. On December 18, 1999, a private ritual of dedication was held with twelve members present. The Protogrove’s first public ritual, celebrating Imbolc, was held on January 30, 2000, and was attended by 45 people. On September 9, 2000, bylaws were adopted and an application for a Provisional Grove Charter submitted. This request was approved by ADF on November 2, 2000, granting “Grove” status within the organization. With this development, RCG was then granted tax-exempt status as a nonprofit religious organization by the State of California. This status was conferred on January 17, 2001. Raven’s Cry Grove held its first festival, Three Realms: A Pacific Druid Gathering, October 17-20, 2002, at Sage Hill Campground of the Los Padres National Forest. The newly elected Archdruid of ADF, Skip Ellison, was in attendance as were members of both the local Pagan community and ADF Groves and Protogroves in five states. From 2000 to 2005 the majority of the grove’s public rituals were held at Raven’s Flight, a pagan shop in North Hollywood. Other venues were used as well throughout Southern California, particularly in the San Fernando Valley area. In the Grove’s overall history, as many as 90 people have attended a single public ritual with Raven’s Cry Grove. With the subsequent closing of Raven’s Flight and the Black Broom, venues have varied in the area as seasonal rites have dictated. Between 2001 and 2003, significant accomplishments occurred among the grove’s membership. The Senior Druid from the RCG’s inception to Samhain 2004, Todd Covert, served in various capacities in ADF including the following: 1) In 2001, elected to ADF’s board of directors as the organization’s Administrator; 2) In 2002, granted clergy credentials as a Dedicant Priest by ADF; 3) In 2003, elected as the “Non-officer Director.” Ravenbard retired as Senior Druid of RCG late 2004 and was granted Senior Druid Emeritus status. Meredith Mc Donald joined the Mother Grove as Members Advocate in 2003 and served later as the “Non-Officer Director” of the ADF national organization. Don [Modig] Hopkins was elected as the second Senior Druid in the Grove’s history on October 30, 2004. He helped the Grove move through its first period of major transition. As happens in all organizations, changes, growing pains, and challenges to meet new needs arose. After six years of service to RCG, Todd Covert left the grove and ADF to form The Druid Academy. Meredith McDonald was called to form a new ADF Protogrove, Awen’s Breath Protogrove, ADF. Modig stepped down from the position of Senior Druid at Samhain 2005. Nicole [Calliean] Harlow was elected to the position of Senior Druid on October 30, 2005. Nicole also serves as ADF’s Southwest Regional Druid. In addition to annual elections at Samhain 2005, new by-laws were also passed in order to better meet the needs of the membership. The grove’s executive committee increased to five members from the previous three. Nicole Harlow stepped down from office in July 2006. On August 1, 2006 Z. Lisa Bennett, RCG’s Pursewarden and Dance Guild Chief of ADF, was elected to the position of Senior Druid. Refining the grove’s vision of excellence, community, and service, and taking further steps towards its realization was the focus of 2006. Private full moon rites were adopted and held regularly, and membership levels were enhanced in order to better mentor new members, to provide a greater scope for development of existing members and to acknowledge elder members for their contributions. Three Realms, held at Malibu Creek State Park, celebrated its fifth year and was very successful. In 2007, Raven’s Cry Grove sought to bring new energy and direction to its outreach projects and to create a first year Apprentice Program to support new members who wished to pursue a course of study in the essential basics of druidry, ritual, trancework, and divination. The grove was delighted to receive The 2007 ADF Founders Award conferred upon us by Issac Bonewits and ADF for our outstanding service to homeless women and children in our community. The grove also instituted Annual Earth Day Rites for grove members and invited friends to spend additional time working with and energizing the Land. Our first year-long Apprentice Group began their studies on November 18, 2007, looking toward their first circle initiation the following year. Our Dedicant’s Group, Bardic Group, and Warrior’s Lodge continued to serve grove and ADF members, and the 6th Annual Three Realms Festival was the best ever at its new comfortable, private, and pagan-friendly location in Paso Robles at Dancing Horse Ranch. 2008 brought a significant growth in membership, so the focus of the grove’s work turned within, toward developing more occasions among its membership to grow, share in private ritual, and strengthen fellowship through a number of enjoyable activities. Leadership development and creating additional leadership opportunities, where there was a need, were also in their infancy stages. The Bardic Group was strengthened under the leadership of our Bardic Director, Riversong, and our first round of 1st circle Apprentices were initiated on October 28, 2009. In keeping with the focus, the Three Realms Festival served this time as a private retreat, rather than a public event, for the grove and other members of ADF in the Southern California area. In 2009 the focus continued to be to provide meaningful, intrinsic experiences for our membership while seeking to provide quality public rituals to bring the pagan community together on the high, holy days. Additional leadership in the council, viable membership, and a new group of Apprentices bode well for the growth and longevity of the grove. So far, our initiates have stepped up into leadership positions both in the grove and ADF, a Women’s Group has been formed, and more work on Pathworking, as ritual preparation, is expected. A look at developing how specific committees would be helpful and empowering is in the works. The grove installed The Four Treasures of Ireland, as a legacy to the grove, as we celebrated our 10th year anniversary at our public Lughnasadh rite, August 9, 2009. Three Realms was a private retreat in Paso Robles and our Apprentice Candidates were initiated in November. Another Apprentice class was initiated in October 2010 and the Grove continued to grow into 2011. A change in leadership structure to separate spritual and business attentions saw Lisa Bennett become Grove Priest and Mike Talvola Senior Druid. Mid 2011 saw another significant change in Grove direction as Lisa left Raven's Cry to follow her spiritual calling. At a retreat at Malibu Creek SP in October, a new Grove structure was designed and put into place. Direction of the Grove is entrusted to the membership at large rather than with officers and council. Focus of Grove activities is toward presentation of public rituals with excellence while maintaining social and educational opportunities. Membership structure is simplified to reflect an egalitarian organization. Shelby, Russell, and Ren were chosen for the honor of being recognized as Elder Members for their ongoing contribution of talents and efforts to the Grove. In 2012 and 2013, Raven's Cry Grove gained members and is looking forward to more outreach to our community and Facebook friends in addition to continuing our tradition of excellent public ritual. Meg and Kaila were chosen by the Executive Council and Grove to be honored as Elder Members. As the Grove has continued to evolve, we began to meet between rituals for a truly enjoyable combined social time and ritual preparations on a Saturday or Sunday afternoon. Our grove has continued to grow and to present public rituals with more and more guests, so as of June 2015, we have 20 local members. Our Spring ritual counted 60 people, our greatest number for regular rituals. Jackie and Darin became Elder members last year, and Sara and now Ariel have also been added to our Elders, our way of honoring their continuing service to our grove. GROUNDRULES: We have a few suggestions and rules to ensure the dignity and sanctity of our gatherings and the privacy of our guests. Soliciting or proselytizing on the behalf of business, political, or religious groups and/or personal interests without express, formal permission of the Grove Council is not acceptable. Disruptive or disorderly conduct is grounds for immediate dismissal from the site as is the use of any unlawful substance or act that would be contrary to any current state or federal legislation. The use of photographic or video/audio recording devices of any kind is strictly prohibited without prior express permission from the event organizers and participants. Individuals in violation of any of the above will be asked to leave the event and will not be welcome in the future. Ritual Dress: Some of us dress in ritual garb such as robes, and others dress in street clothes. Our rituals are worship services, so we ask that all dress in a manner that shows respect for our Kindred. Children: As Neo-pagans wanting to pass on our traditions to our young ones, we welcome their presence. However, we do not currently offer child-friendly alternative activities to keep them occupied during ritual. For children who are very young or who become distracted easily, this can cause disruption within our sacred time or perhaps put a child in harm's way in a natural setting (poison ivy, rattlesnake bite, etc.). Please consider what is best for those present, yourself, and your child when deciding to bring them along, and please be aware that children MUST be supervised consistently by their parent or guardian during our time together. Animal Companions: Though we understand the joy of animal companions, we do ask that you refrain from bringing them to public ritual. This protects your animal as well as yourself and other guests who, unknown to us, may have severe allergies, or a real fear or aversion to an animal due to personal trauma. Children also love to interact with animals, but sometimes this can be problematic. In addition, state park laws discourage bringing animals to their parks and California State Law requires a 6 foot leash be used on dogs along with having to maintain constant supervision. Some state parks have additional restrictions that must be adhered to. The grove wants everyone to feel that they are in safe space when they come to ritual, with a minimal amount of distractions. Please respect the sanctity of our worship experiences together, and protect your beloved pets by keeping them safe at home. Length of Ritual: Though we try to practice brevity, the grove feels it is most important that we take the time necessary to properly address the Kindred and work with each other as a community where everyone has a chance to participate on some level. Generally our rituals last about 90 minutes, once begun. However, on the highest of holy days (Samhain and Beltane) the ritual could last longer. Please arrive ready to give of this time to the gods and feel free to bring a camp chair should you feel that standing through the entire ritual may be difficult. Offerings: Please feel free to bring offering for the deity of the occasion, your personal patrons, or any ancestors or nature spirits. There is an opportunity in the rite for these offerings to take place. Potluck: Our tradition is to hold a potluck meal after ritual. It is especially appropriate to bring something which you make yourself, but that is not necessary. Some of us are flesh eaters, so any sort of food is fine, but please remember that some of our members and guests are vegetarian. If you are vegan or are on another special diet, you probably should bring your own food rather than relying upon others to recognize your needs. Photographs: Raven's Cry Grove routinely photographs our events and participants and places some of the photos on our web site. If you wish not to have your photo on our web site, please inform the event organizers. Please refrain from taking personal photos or videos during ritual time. Personal Concerns: Please inform our event organizers privately if you have an aversion to touching or other similar concerns so we may make you as comfortable as possible. Cell Phones: So as not to disrupt the energy in ritual, please remember to silence your cell phones. Students: We welcome students of religion and anthropology to our gatherings, but ask that real names not be used in any reports or other descriptive writing that might result from your visit. Please talk about your studies with our Senior Druid or Presiding Druid of the ritual, and please be respectful of our spirituality. Outreach Projects: Raven's Cry Grove is committed to serving the community with a number of outreach projects. If you are able to donate towards these ends it is much appreciated. Donations: The grove asks for a suggested donation of $10 per person to cover the costs of the ritual and site rental to help us continue to provide public ritual. Whatever you are able to give is most welcomed. However, should this be a difficulty, please know that you are still most welcome. Your presence is valued above all. Commitment to Excellence: in Scholarship, Ritual, and Collective/Personal Development within the context of the Druidic path. Commitment to Voice: in a democratic environment of equal exchange and valued input. Commitment to Integrity: Providing a balanced structure of support from which to honor the gods and one's spiritual callings in a creative, responsible, and sound way. Opportunity to develop one's spiritual path in a small supportive environment. Opportunity to learn, share, and discuss the scope of the Druid's path (i.e. Dedicant's Program, Bardic Group etc., and public and private collective work). Opportunity to form lifetime bonds of friendship and support within the context of the grove's spiritual community. Taking Action to serve the Pagan Community of Southern California. Taking Action to serve the environment and others through active community outreach (i.e. clean-ups, drives, donations, events). Taking Action to model a positive presence as pagan-folk to the entire community. As a Druid Fellowship we try to be inclusive and friendly so that all people may find our rituals fun and comfortable as well as a spiritual experience. In that light, we have created this page to give a brief overview of our ritual structure so that you know what to expect when you attend our next ritual. Although the grove's ritual center is a Celtic one, we also celebrate various High Days within the context of other cultures. Typically public rituals, for the four fire festivals, Samhain, Imbolc, Beltane, and Lughnasadh, will be done according to a specific Celtic tradition. The Solstice and Equinox rituals are often from other cultural traditions and reflect those that are practiced among the membership of Raven's Cry Grove. As we are a Neo-pagan grove, we do not seek a pure reconstruction of an ancient rite, we seek the essential core of that tradition and place it within the context of a Neo-pagan Druidic approach and ADF's Core Order of Ritual (for more about ADF please visit our links section which will guide you to their website). This Core Order, based on scholarship and magical principles, is the constant throughout the rite. As you attend more rituals, the patterns should become more familiar even though each rite is unique. All of our rituals are primarily devotional in nature. In other words, each ritual is designed to strengthen the Three Kindred (Ancestors, Nature Spirits, and the Shining Ones) through our remembrance, praise, thanksgiving and offering. By doing so, we seek, as a community to draw the Kindred closer to us so that we may open, strengthen, or maintain good relationship with them and accept their blessings more readily. There will be opportunity at each ritual to offer to any one of the Kindred including those deities with whom you work on a personal level, so feel free to bring offering for them or for the deity of the occasion. Appropriate offerings, also known as sacrifice 'to make sacred,' are anything made of your hands, praise through the spoken word, song, silent prayer, and certainly anything from your heart for sincerity is key in any ritual undertaking. Please be aware that when you offer, it is not the time to ask for something, it is only a time to seek good relationship and offer your devotion. There is another time in the rite where the asking can take place for optimal benefit. The more you participate fully by bringing your energy into ritual, the more the ritual will become a thing of beauty and peace. Because our rituals are primarily devotional and meant to form and strengthen bonds with the Kindred, these are rituals of 'drawing in' rather than 'keeping out.' As such, we do not 'cast a circle' as may be seen in other pagan traditions. We do cleanse the space, the participants, and call on a protector at the beginning of the rite and we sanctify the Three Hallows (Well, Fire, and Tree) where we will make offering. These three Hallows are then opened as Gateways at the Sacred Center for the greatest communication possible between the Kindreds and the folk present at the rite. Without a circle that is cast, it is easier to move in and out of the ritual space if needed, but it is best if everyone stay present until the ritual is over so as not to disturb the quality of energy raised. Since magical work in a public setting can be of great consequence, we rarely do this work in a public setting. However, much of the work in ritual does realign the participants with primordial time and beginnings, and so these rites are by nature highly inspiring and healing. Honoring the Land and the Great Mothers of the Earth is central to any Druidic path. In addition, the notion of divine inspiration, or the fire in the head, is essential to those seeking the guidance of the Kindred and the indwelling of health, creativity, abundance, and true wisdom. As such we begin the work of the rite by Addressing the Earth Mother and the Powers of Inspiration, offering to them, and asking them to lend their energies to bring vitality, beauty, divine inspiration, and the presence of palpable truth and honor into the sacred space. The mystery of fire in water is also explored as the group attunes themselves with these elements, thereby placing those gathered into sacred time, as they stand and move in a place between the worlds. After the participants have been prepared, the key elements addressed, the hallows sanctified, the gates opened, and the Kindred called, a time for personal offerings are made. Once all is ready, the Main Deities of the Rite are called and offered to. Special ways to honor the deity then follow. This could include storytelling, song, mythic action, affirmations, and other special ways that the folk can participate together in honoring the deity and the energies and lessons of the season. In the Celtic tradition, hospitality is incredibly important to one's relationship with their community and the Kindred. To be inhospitable was to be a disgrace indeed. Therefore, if one offered a gift with sincerity, a gift would be offered in return. This is not an obligation but an act of joy and community. In this spirit, the energy of the ritual turns, as we have given, so too, the gods wish to offer their gifts to us. We wait in anticipation and joy to hear and receive what our Dear Ones wish to bestow. An omen is taken to get a barometer of the energies that each of the Kindred offer us. We fill the blessing cup and ask the Kindred to imbue these blessings in the content of the cup with the waters of life, and then all drink heartily. It is important to know that The Blessing Cup contains an alcoholic beverage. If you do not wish to imbibe, or if you are ill, just holding it to your forehead or holding it above you, picturing the blessings moving through your body, will suffice. As you hold the cup, the perfect time has arrived to petition the gods for what you need, either quietly or spoken aloud. If you wish to offer your blessings to another, pour a small part of its contents onto the ground as you speak their name and their needs. People are also free to toast, boast, thank, or just whoop for the joy of it. Caution: dancing and drumming with abandon have been known to occur while the Blessing Cup is being passed. After the Blessing Cup has been passed, if there are any additional workings to be done of a magical or receiving nature it will take place in this part of the ritual. Following, we will thank the Deities of the Occasion and all the other powers that were assembled at the rite. The gates will then be closed and a final blessing will be offered as the ritual comes to a close. Afterward, an additional sharing of hospitality is enjoyed by all as we share in a potluck! Please bring something sumptuous to share and remember that we also have several vegetarian and vegan guests. Anything made of your hands is always the best as it shares your blessings with the community. The following is the Core Order of Ritual (COoR) for ADF High Day rituals as approved in late 2006 by the ADF Clergy Council. This is not a complete re-write of our current Order of Ritual, but rather a clarification of what we're already doing, meant to answer the questions, "Just what ritual steps are the minimum necessary for a High Day rite to be considered an ADF ritual?" and "In what order should these steps take place?" Certain actions/concepts below are "suggested", often listed as "may include" or "is most commonly represented or included". In these cases, the main heading is required for a rite to be called "ADF", just not all the choices listed—and there may be other acceptable choices as well that aren't listed. However, where the word "must" appears, this is a required action. Remember that there is usually a strong cosmological or theological reason for each part of the rite to appear where it does. Some modifications to the COoR are expected, including additions to the main headings and particularly steps from past Orders of Ritual not specifically listed here, but any such modifications should have a particularly strong justification. Note also that following the Core Order is a listing of things an ADF ritual does not include. Calling the dualtheistic "Lord" and "Lady"
Our Cafe Press Shop: Mugs, shirts, tote bags and more with our logo. Let's go shopping!